Enda Kenny TD was the most successful leader in the history of the Fine Gael Party, having held the position from 2002 until 2017. Under his leadership, Fine Gael became the largest political organisation in the State. He was elected Taoiseach on 9th of March, 2011 and subsequently became the first Fine Gael leader in history to be re-elected as Taoiseach on the 6th of May, 2016. He has spelled out his vision of Fine Gael as a party of the progressive centre, focussing on the rights and responsibilities of all citizens. Enda was first elected to the Dáil in a bye-election in the Mayo constituency in 1975 following the death of his father, Henry. He was a member of Mayo County Council from 1975-1995 until his appointment to the Cabinet. He has been re-elected to the Dáil at the 11 General Elections since, and was twice elected Taoiseach, in March 2011 and May 2016. He previously served as a Cabinet Minister (Tourism and Trade 1994-97) and Minister of State (Education and Labour ’86-87). When Enda became Fine Gael Leader in 2002, he immediately embarked on a campaign to revitalise the Party, which bore fruit at every subsequent election. Fine Gael went on to become the biggest Irish Party in the European Parliament and in local government. The longest serving TD in Dáil Éireann, he was also Vice-President of Fine Gael’s European affiliate, the European People’s Party from 2006-2012. From Islandeady, outside Castlebar, Enda is a former primary school teacher. He has served in a wide variety of Party and Parliamentary positions during his time as a TD. 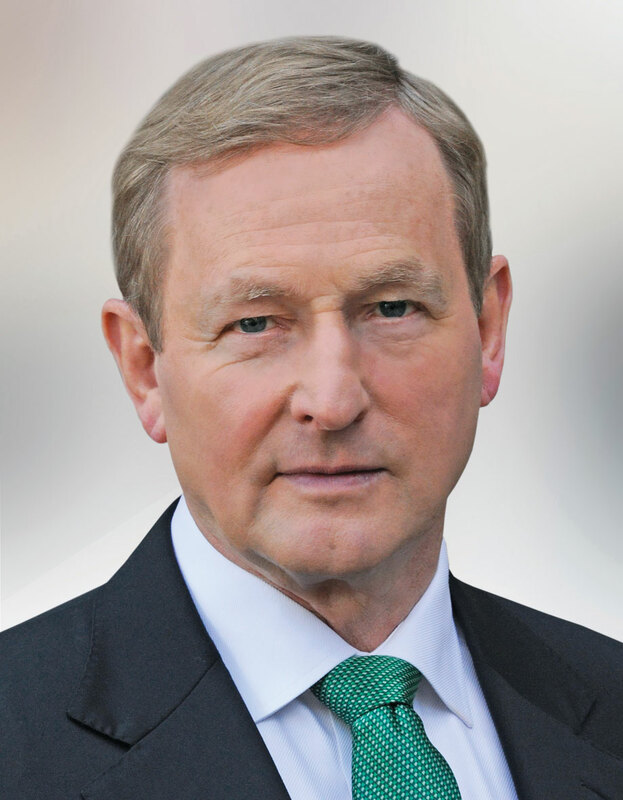 From 1994 to 1997 Enda represented Ireland on the World Stage as Minister for Tourism and Trade. He presided over a revolution in Irish tourism as the numbers visiting this country soared thanks to initiatives spearheaded by his Department. One example of Enda’s hard work can be seen on the streets of Dublin every March – a vastly improved St Patrick’s festival and parade. He oversaw an unprecedented growth in tourism business, and Ireland’s trade position internationally. As Minister he also chaired the European Union Council of Trade Ministers during Ireland’s Presidency, and he co-chaired the successful Singapore round of the World Trade Organisation talks in 1996. He also headed the EU Council of Trade Ministers during Ireland’s Presidency of the Union. Through the fostering of international trade, so crucial to the birth of the Celtic Tiger, Enda played a significant role in creating the economic boom that began under the last Fine Gael-led Government (’94-97). Married to Fionnuala O’Kelly, Enda has three children – Naoise, Ferdia and Aoibhinn. Enda divides his time between Mayo and Dublin – as well as constantly touring the country (he visits every constituency in the country on a regular basis). A fan of Bruce Springsteen, Enda likes to hillwalk, play golf and cycle. He climbed Mount Kilimanjaro in aid of three Mayo charities in 2003, and regularly undertakes charity cycles. The community of Castlebar will miss Brendan Henaghan who passed away this week. Liam Cosgrave’s most striking quality was his unshakeable conviction, whether to his deep Catholic faith, or to preserving the democratic integrity and security of the State.